Edward Stephens puts the new Toyota Yaris through its paces. Toyota’s popular little Yaris has been given an all-new look – yet retains the model’s Tardis credentials of small on the outside and big on the inside. But now it comes with an even sharper, more futuristic design to give it added appeal to younger buyers. Ever since the first Yaris hit the road in 1999 one of its biggest selling points was its compact dimensions combined with generous interior space, and Toyota was determined not to let this winning formula slip. So even though the new model is 100mm longer – which means extra leg room at the back – it’s still one of the most compact models in its class. In fact the nice thing about this car is its big car feel from behind the wheel. Too many small cars feel just that – small. But once you are in the Yaris there is never a feeling of confinement. And the panoramic glass roof which stretched the whole length of my test car gave the car an even more spacious feeling. One of the major selling points of the new Yaris is Toyota’s Touch multi-media system, which is operated via a colour screen mounted in the centre of the dashboard. My test car, however, had the upgraded Touch and Go system which was free on all cars registered before November 30 but now costs an additional £500. But even at £500 this is a super little system which not only includes touch screen radio controls, but a full satellite navigation system complete with speed camera and traffic alerts and can even be linked into Google Maps. The navigation system is not only the best and easiest to operate that I have come across – with full postcode recognition – but has a real human sounding voice rather than the traditional synthesizer-style voice of most sat navs. Touch and Go also comes with a reversing camera which projects onto the screen the view behind you overlayed with a grid showing just how close you are to objects at the rear, while reversing. With the wheels tucked tightly into every corner the Yaris has short overhangs, making it an ideal car for manoeuvring in city traffic. A brilliantly small turning circle makes multi-storey car parks child’s play. With the 1.3-litre engine under the bonnet the Yaris is no hot-hatch but it’s well up to the job with adequate performance even when four up. I did find the six-speed manual gearbox notchy, however, often with first gear very stiff to engage, although that could have been influenced by the lack of miles on the clock. The dashboard is stylish and functional with dials that are clear and easy to read with the briefest of glances and the digital speedometer of earlier models has been replaced with a large analogue one. Gear shift indicators in the form of illuminated green arrows advise you when to change up or down to conserve fuel but even if you ignore them this little car is pretty frugal at over 52 miles per gallon. 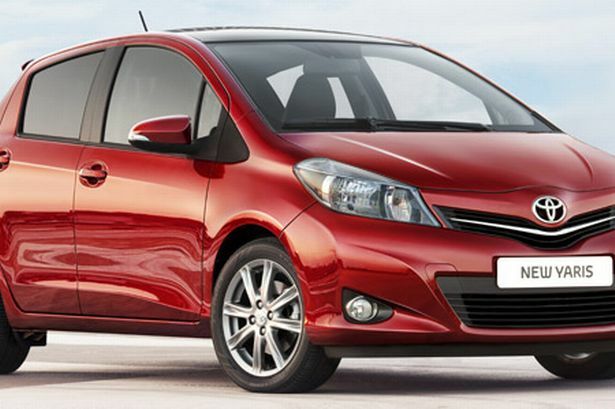 And a five-year warranty makes the new Yaris a very practical car for economical motoring.